Dr. Alexander Milton Ross was born in Hastings County, Belleville, Upper Canada, on December 13, 1832. He was the son of William Ross (1792-1844) and Fredericka Grant (1796-1855, and married Hester Harrington in 1857.
duty to help the oppressed to freedom. 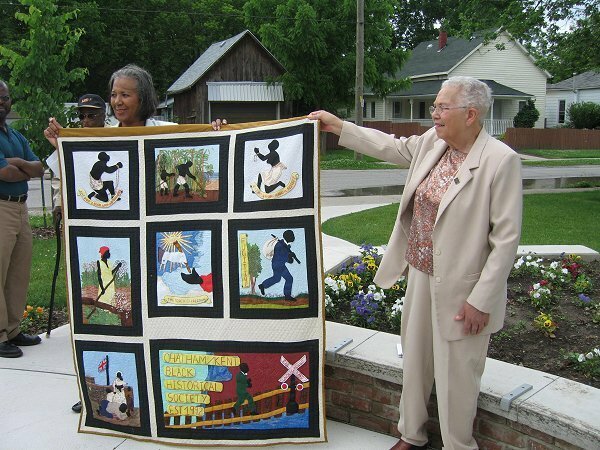 A Freedom Quilt held by Brenda L. Travis and Gwen Robinson during Dr. Alexander Milton Ross Day at the British Methodist Episcopal Freedom Park on June 20, 2009. When Ross met refugees and anti-slavery activists in Toronto, he translated their hopes into action. Thereafter, he led a multiple life as an abolitionist, a medical doctor, a naturalist, and writer. When he was 23 years old (1855) he went on extensive tours that took him as far south as New Orleans, Louisiana, using his background in ornithology as a pretense at doing research in order to spread news about Canada and how fugitives could get there by travelling at night while staying at safe refuges during the day. He was known to give the freedom pursuers money, a compass, knives, pistols and food. 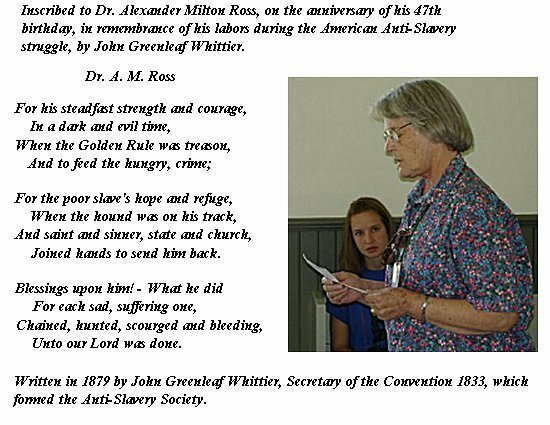 Dr. Alexander Milton Ross had a broad connection with the anti-slavery movement and the Underground Railroad. Using his interest in birds as a cover for his daring Underground Railroad activities, he publicized the route to the Black Settlements in Canada and the location of safe houses along the way. He supplied the slaves with provisions and often accompanied groups to their destinations between Niagara Falls and Windsor. Reverend Josiah Henson's Dawn Settlement at Dresden was one destination on the Underground Railway. 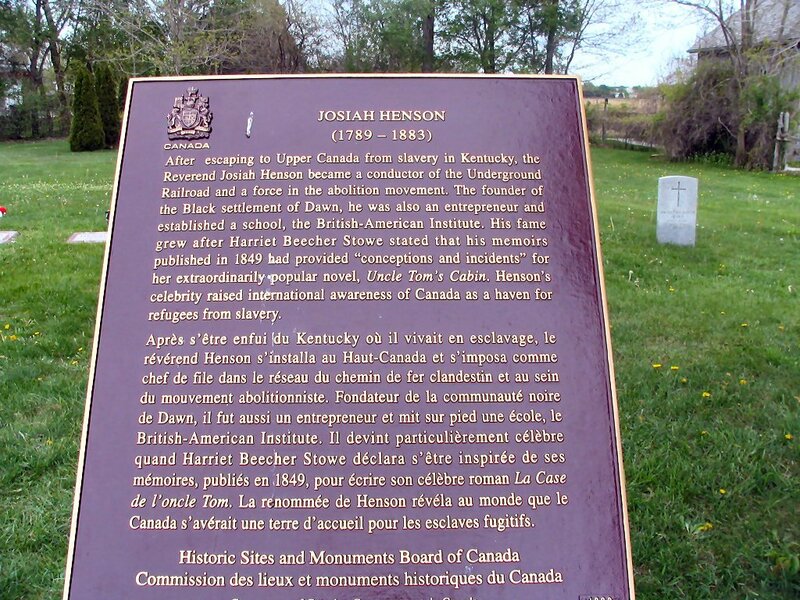 Another one was Harriet (Ross) Tubman's family refuge in St. Catharines. He became a personal friend of abolitionist John Brown, and his work brought him to the attention of Abraham Lincoln, who commissioned him as a special agent to monitor the Confederate activities in Canada during the Civil War. Ross's work,declared Lincoln, shortened the Civil War by the better part of a year. 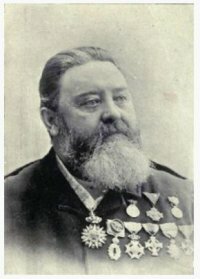 Between the years 1876 and 1881, Dr Ross was knighted by the emperor of Russia, and honoured by the leaders of Italy, Greece, Saxony and Portugal; he was a member of the College of Physicians and Surgeons of Quebec and Ontario; he was a founder of the Society of the Diffusion of Physiological Knowledge; he was appointed Canadian Consul in Belgium and Denmark, and he received the decoration of the "Academie Francaise" from the government of France. Dr. Ross died on October 27, 1897, in Detroit, Michigan, USA, and his body was returned to Toronto for interment. The official opening of the “People and Places: London’s Black Community” exhibit at Museum London at London, Ontario, took place on January 31, 2004, just prior to Black History Month (February). Featured was an historical portrayal of Dr. Alexander Milton Ross, considered a great shepherd on the Underground Railway. Nevertheless, Dr. Alexander Milton Ross was a little known anti-slavery activist and 'conductor' on the Underground Railway until Steven Duff (a former Toronto-area High School music teacher) now living near Parry Sound, Ontario, wrote the historical novel, Hunter of Dreams (published in 2001). Gillean Blair read this poem by John Greene Whittier in the church at the site of Uncle Tom's Cabin in Dresdin, Ontario. 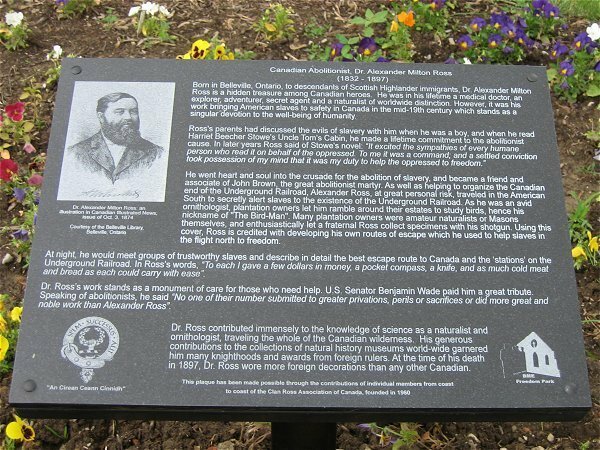 This plaque was unveiled on June 20, 2009, in the BME Freedom Park of Chatham, Ontario, by Clan Ross - Canada and the Chatham-Kent Black Historical Society. - Article by Robert C. Gunn in the Fall Issue of the CRA-Canada Newsletter in 1999. - The Dawn Settlement, Uncle Tom's Cabin in Dresden and the Buxton Museum Tours at the 2006 AGM. - the Annual General Meeting - June 25, 2006. - Dr. Alexander Milton Ross Day - June 20, 2009. - Dr. Alexander Milton Ross Day with video clips. Clan Ross - Canada is grateful to Andrew Ross Thibodeau for his part in organizing the 2006 AGM followed by the Dr. Alexander Milton Ross Day in 2009. We thank Steven Duff, author of Hunter of Dreams (published in 2001) for his sustained enthusiasm throughout the developing project. Recognition of "The Birdman" was made most meaningful by the presence of Janet Montague Jones and Gillian Blair (with husband Patrick), great-great-granddaughters of the Canadian hero, Dr. A. M. Ross. They travelled from England to join the Clan Ross - Canada gathering in 2006. On the subject of our tours on June 17, 2006, we thank the guides at the Dawn settlement in Dresden as well as Shannon Prince who was our host at the Buxton National Historic Site and Museum. Finally, we are indebted to Gwen Robinson, Curator of the Chatham-Kent Black Historical Society, as well as Brenda L. Travis and Reverend Leona Segee-Wright, for their part in making Dr. Alexander Milton Ross Day ceremonies so successful at both the Chatham-Kent Black Museum and Historical Centre and the BME Freedom Park.